Equal Time: To be fair to Virgin Mobile and LG I’ve also added my Virgin Mobile LG Optimus V Top 4 Pleasures. Check them out ... or go straight to the bad news below. 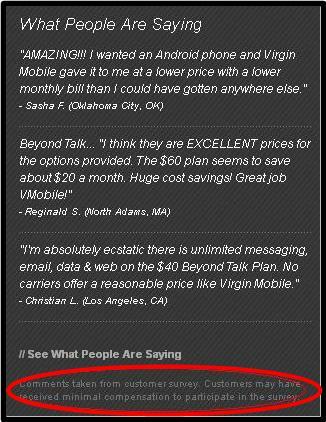 Astonishingly, if you visit Virgin Mobile’s USA website you’ll find the LG Optimus V phone I bought last winter gets a user rating of 4.6 stars out of 5. I’m not sure I’d give the phone 3 stars and I certainly wouldn’t go to 4; 5 is out of the question. The fine print, circled in red above, reads "Comments taken from customer survey. Customers may have received minimal compensation to participate in the survey." 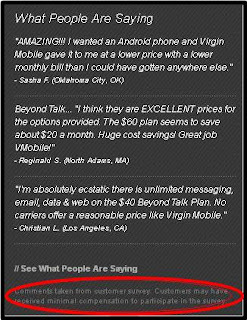 But more to the point, it doesn't appear to be possible to read these 1,414 reviews; click on the //See What People Are Saying link and you're taken to another page that displays only a sampling of testimonials, and those aren't about the LG Optimus V ... they're about Virgin Mobile's attractively priced android phone plans. Just as annoying, it doesn't seem possible for me to add my own review of the phone. With these facts in mind, let's get back to my Annoyances. Unexpected Crashes Mercifully these don’t happen often, but in the 5 months or so I’ve had this phone I’ve experienced half a dozen hangs where suddenly I could do nothing with it. My first apparent crash happened barely a month into my subscription; finding I couldn’t get the display to turn back on by pressing any button I plugged the phone into a wall outlet and everything returned to normal. Since then I’ve had a few encounters where the only way to revive the phone was to take off the back and remove the battery. (Pressing the power button for 30 seconds to a minute had no effect.) Not fun. Subpar Antenna Recently I spent a few days in the wilds of western Maryland near the West Virginia border and found my Optimus was worthless for either voice calls or data transmission or reception. I was prepared to blame Virgin Mobile’s owner, Sprint, for its scanty rural cell tower infrastructure, but I encountered a couple of Sprint subscribers who could use their phone—including one who had a Sprint Wi-Fi hotspot device that worked just fine. So I’ll blame my Optimus instead. GPS System Needs Cell Service to Function During this same trip to western Maryland (see Annoyance #3 above)—when my Optimus was worthless as either a phone or a data device—I made another discovery: the phone’s GPS system can receive satellite signals to its heart’s content but it can’t resolve them into an actual map location without help from earthly cell towers. I’m not a telecom nerd and I have no idea whether this is an android problem in general or a cheap android phone problem in particular, but I’m satisfied the LG Optimus V needs cell service to enable its built-in GPS system to function properly. Until my phone returned from the Maryland wilderness and began displaying 3G or 1x cell service my Google Navigation app would happily display its distinctive blue location arrow against a fuzzy white background that refused to resolve a single street, road, highway, lake, river, or anything else topographical. Utterly maddening. Powerup Annoyances More than once I’ve fired up my Optimus at the beginning of the day and noticed that some of the application icons on my main screen display as generic android icons and not as the distinctive icons their developers devised for them. In this state, which may last for a minute or so, if I try to launch any of these generic-icon apps my phone will inform me they haven’t been installed. (My suspicion is that I've moved these apps to my SD card and the phone takes longer to find them.) If I wait a bit the distinctive icons usually replace the generic ones and everything returns to normal. However, I once had the phone inform me that several apps I’d actually installed (and never uninstalled) were no longer there—I had to reinstall them. Very perplexing. 10/26/11 update: last week I experienced the phone-still-telling-me-apps-I'd-installed-weren't-installed annoyance well beyond startup, so I decided to draw a page from the PC-user's handbook and reboot. That did the trick, so in this one instance, at least, I do have a workaround to suggest. When in doubt, reboot. As you can see from the icon in the upper lefthand corner (the one that resembles a tiny hard drive with an exclamation point next to it), when I captured this screen the other day I was facing a low memory condition. When these glitches first started to crop up and I had access to this Memory/Cpu information screen I couldn't figure out the source of the problem. After all, the green-and-yellow pie chart at the upper left tells me that more than half of my memory -- 267 MB of 424 MB total -- is free. So why am I low? Not long after my first low-memory condition I discussed it on the phone with a friend who happens to be a computer scientist and he surmised that the bar graph in the middle, labeled Phone, held the key. (You'll notice this graph is an ominous pink sliver, while the other two are cheerful yellow and green slabs.) He suggested the LG Optimus V had 179 MB of on-board storage and it was this kind of available storage -- not SD Card storage or regular green memory -- that determined whether the phone entered a low memory condition. All my experience with the Optimus V bears him out. Available memory means nothing; available on-board storage means everything. The tipping point appears to be 18 MB; drop below that and you'll enter a low memory condition. I find I can generally install about two dozen apps on the phone before I enter a low memory condition. Your mileage will vary, of course, depending on the size of the apps you install -- and they vary quite a bit. My B&N Nook reading app takes up a whopping 12.12 MB; Wifi Analyzer a mere 372 KB. Do you have an LG Optimus V from Virgin Mobile or one of Virgin’s other android phones? If so, tell me if your experiences jive with mine—or if they’ve been stellar. Either way I’d love to know.